Getting your food truck road ready has been a labor of love, but you are almost there. All your hard work will pay off when you see your dream of running your own food truck come to live. In our series, we first looked at selecting your food truck and building it out with all the necessary equipment. Now that is accomplished, you need to start working on your food truck menu. When you are designing the menu board, leave the upper right hand corner or the center of the board for your most popular dishes. The eye is naturally drawn to these spots first and this way you are ensuring that your best dishes are noticed first. Not every passerby will take the time to read the whole menu so you want to make sure the most popular dishes you offer pops easily off the board. When you are worried about having something for everybody, it is tempting to fill your menu with lots of options, but that can get overwhelming for both you and your customer. For one thing, if there is a lot of items all jammed together on the menu board, it can make it more difficult for your customers to choose and they might head to another food truck with a simpler menu. Also not to mention, having too many items to make will also strain things for you inside the food truck. There are only so much space back there so storing a lot of ingredients can be difficult. Plus you don’t want the taste to suffer and that can happen if your staff is juggling making too many very different dishes. Along the same vein, even if you just have a few dishes to promote, don’t fill the board with extra information that isn’t necessary. Keep everything short and sweet and make it easy for the customer to find the information they are looking for. Prices are always going to fluctuate and certain vegetables may or may not be in season at different times of the year, so make sure your menu board is easy to update whenever you need to. Fancy boards might be harder and more expensive to update so take that into consideration. Your food truck menu board is another great way to reinforce your brand. Use colors and visuals that reinforce your brand and attract potential customers. If you want to include pictures, stay away from clip-art and use photos of your actual dishes instead. For best results, hire a skilled food photographer to take the pictures for you. Bad photographs can actually do more damage than no photos at all. Nothing is more embarrassing to you and distracting to the potential customer than typos on the menu board. It might seem like a little thing, but it does matter. Remember, that we are all susceptible to typos. Our minds tend to see what we expect it to say and not what it actually says so that is why it is best to have extra pairs of eyes checking it for you. If a small mistake gets spread around social media, it can actually cost a lot of damage to your reputation. Readability is the most important ingredient for creating your food truck menu board. Fancy fonts and calligraphy might seem fun and interesting, but what is the point if your customers can’t understand what is on the board? Don’t use dollar signs. You don’t want your customers focusing on the price instead of the actual meal, do you? Don’t use columns of numbers. Instead write creative descriptions of what you are offering. Add some fun adjectives to your descriptions to make potential customers smile and be enticed to try out the dish. One of the biggest 2018 food trends is the push for more plant-forward cuisines. As more people are starting to see the light about the important role vegetables play in a healthy diet, customers are looking for more dishes chockful of vegetables. Interestingly enough desserts are another hot food trend. If your food truck is part of a food franchise then you might not have a lot of wiggle room in your menu, but where you are allowed, try to keep your menu up-to-date with what is going on in the culinary world. Besides what goes on your food truck menu board and how you design it, you need to think about what type of menu board to purchase. Electric menu boards are becoming popular on food trucks because they are easier to update and you have more options with cool graphics, but that might not fit the feel of your food truck. You can also go with a chalk board that you hang right outside your service window or even go with a sidewalk chalkboard to attract more customers over. Just make sure you stay true to your brand. Once you got the customers to line up and place the order, it is now time for you to wow them with your delicious meals and exemplary customer service. Everything needs to be working in tandem. The creative sign draws them in and the food and service keeps them coming back for more. If you are new to the food truck business this is especially important. 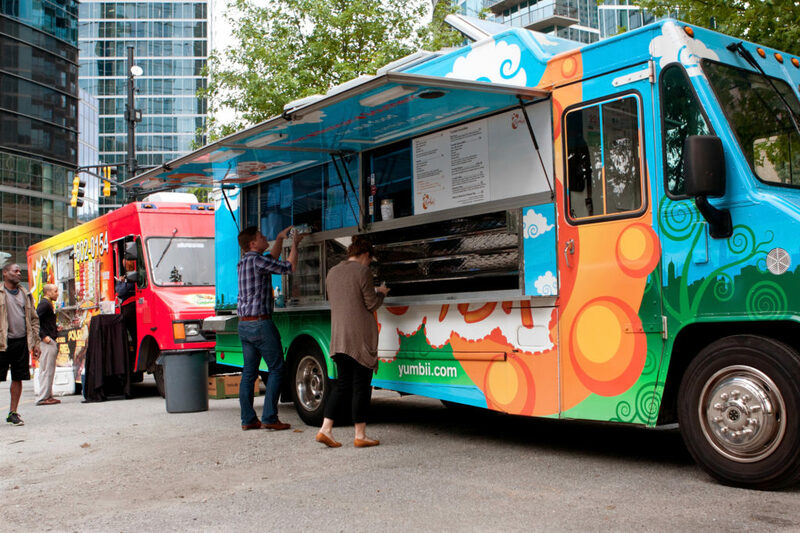 Want to own your food truck, but not sure where to start? Consider owning a Zac’s Burgers food truck. Get more information about this family-friendly burger joint and their food truck business here.